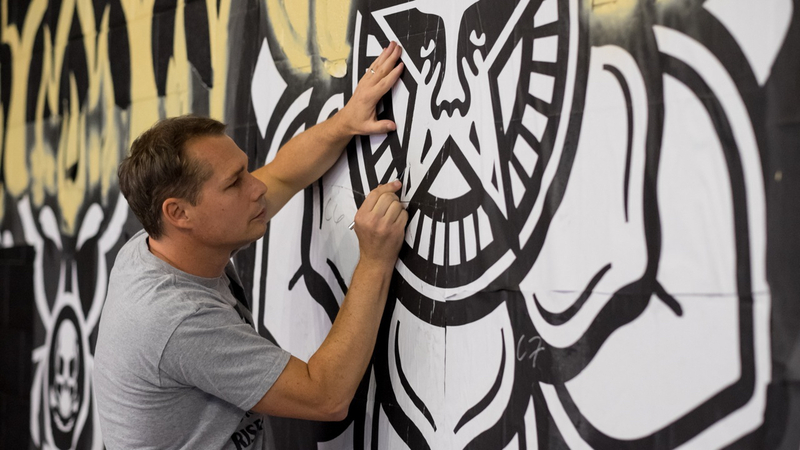 It may not be quite accurate to describe the 46-year old South Carolinian known as Frank Shepard Fairey as the father of street art, but he is nonetheless one of the figures in the modern movement who is most looked up to by many of today's fledgling urban creatives. That is in large part due to his creation of such enduringly iconic images as "Andre the Giant Has a Posse" and the now-immortal Barack Obama "HOPE" poster, but it also has much to do with his steadfast philosophy to simply "question everything". Fairey is not a creative to hide behind the mystique of his own image, having declared that if an artist "won't put down his magic brush and head the fight against the oppressor, then he isn't a great artist." Whether or not one agrees with that statement, there are certainly plenty of similarly principled statements of Fairey's to pick through, indicating a level of political engagement befitting his sustained primacy within - and well outside - the world of street art. 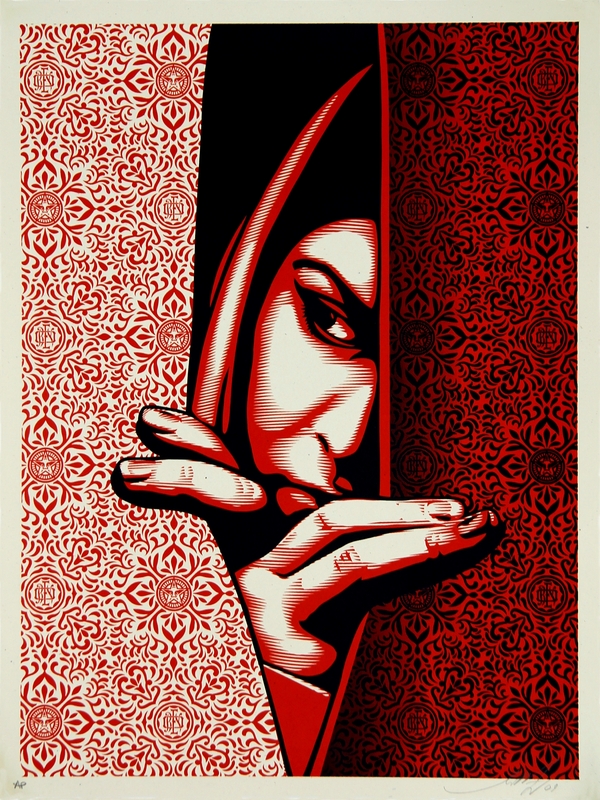 Arty-Fact: Created in 2006, the ‘Rise Above’ series was Shepard Fairey’s commentary on the abuse of power, governmental hypocrisy and loss of civil liberties, as well as a call for people to rise above these problems. Encouraging them to change the system or work around its limitations. Part of this series, ‘Uncle Scam’ is a verbal and visual twist on conventional expectations of patriotism. 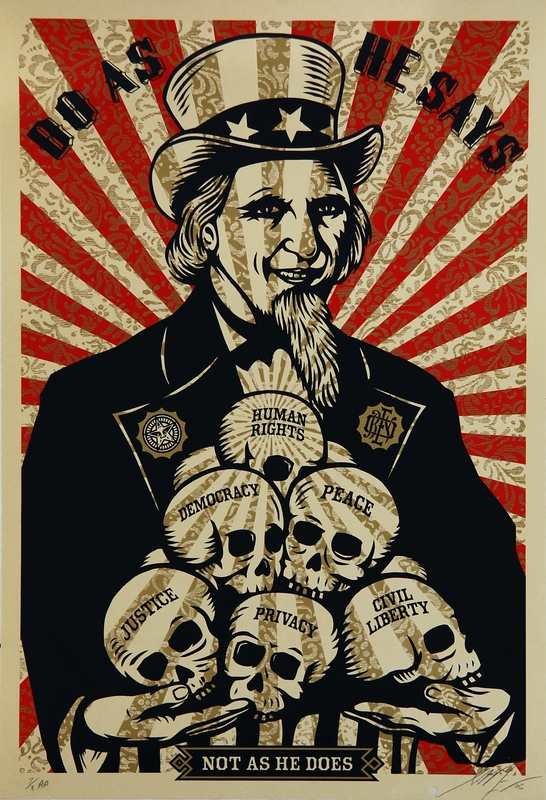 The iconic image of Uncle Sam is juxtaposed with the death of human rights, democracy, peace, justice, privacy and civil liberty – depicted by placing each of these values on a human skull. Arty-Fact: In 2009, the artist donated his stencil collage of “Israel / Palestine” to the Robert F. Kennedy Center for Justice and Human Rights. This non-profit charitable organisation works to realise Robert F. Kennedy’s dream of a peaceful and just world through local and international programmes. The programmes assist the disadvantaged, build the next generation of leaders, and tackle problems facing society. Released the same year, the print, as is common with Fairey’s work, is shrouded in symbolism which the viewer is encouraged to interpret and draw their own conclusions. Notice ‘Obey’ in the pattern of the curtains? That said, it is also perhaps unwise to categorise Fairey as a man who sought to make an impact in street art and little else - instead, he is one of the figures at the forefront of the ongoing 'crossover' of street art into acceptance by the higher echelons of the commercial art world. But as with many other street artists who have achieved the same feat, it was more by accident than by design, the artist recently reflecting that "I went to art school and I've drawn and painted my whole life - my goal was to make art by any means necessary. For a long time that meant street art and T-shirts were my only options. Now I have a lot more options." For many years, Fairey's best-known image among the wider public was the "Andre the Giant Has a Posse" sticker campaign that he created in 1989 while enrolled at the Rhode Island School of Design (RISD) in Providence. 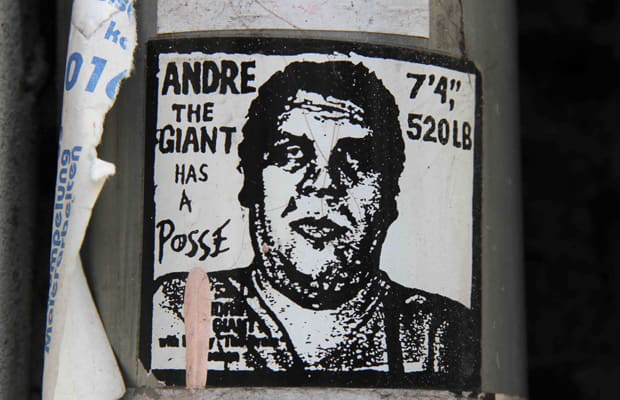 With Fairey declaring the campaign at the time to be "an experiment in phenomenology", the sticker - depicting the wrestler Andre the Giant - was distributed by the skater community throughout various United States cities. 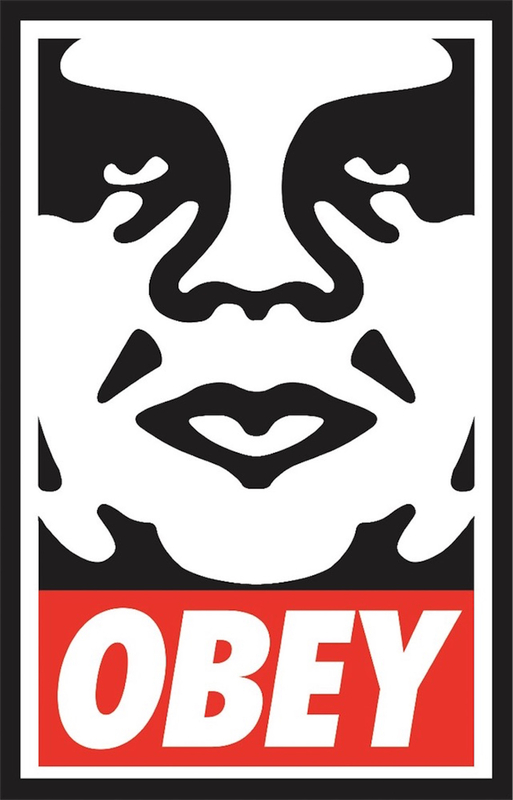 A new image of the wrestler's face was created by Fairey in the 1990’s in response to the threat of a lawsuit from Titan Sports, Inc., with the trademarked name Andre the Giant also replaced by the now-iconic slogan "OBEY". What has since become known as the OBEY Giant image has now, itself, been relentlessly reused and parodied across the world. 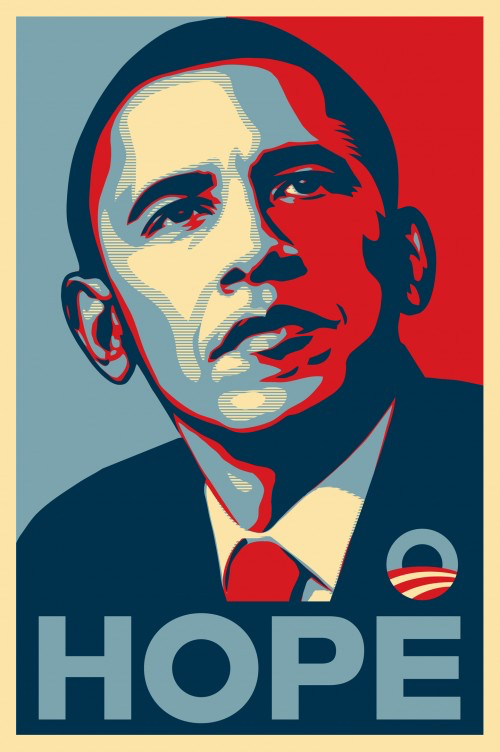 There were plenty who presumed that Fairey would never top the OBEY Giant's global reach, at least until the creation of a certain poster emblazoned with the word "HOPE" in support of Barack Obama's 2008 candidacy for President of the United States. Now one of the most widely published and parodied artistic images in recent memory, it was initially just one of a series of posters signalling Fairey's backing for the eventual President. Public approval of Obama may have inevitably never again scaled the heights seen in those heady "HOPE" days - Fairey admitting in a 2015 interview with Esquire that the President's achievements in office were "not even close" to his expectations. However, the Charleston native has expressed his pride over the poster's broader impact "as a piece of grassroots activism". Many would suggest that with such a stellar catalogue of achievements behind him, extending well beyond his street art origins, it would now be understandable for Fairey to relax and reflect on them. Instead, he remains an impressively engaged and influential figure, his most recent projects ranging from murals in Hong Kong to both group and solo exhibitions around the world. No stranger to legal action and controversy, Fairey was back in the news recently. In 2015, the artist was commissioned to create murals in the city of Detroit but was subsequently accused of leaving some unauthorised work on buildings that led to criminal charges. A Wayne County Circuit Judge dismissed the felony case in June 2016. The City of Detroit plans to appeal. Whatever the eventual outcome of that case, Fairey's legacy as a socially and political conscious street artist, graphic designer, illustrator and activist - for all of the right reasons - will remain intact.